Alex Galchenyuk scored early in overtime tonight as the Montreal Canadiens slipped past the New York Rangers 3-2, mere moments after Don Cherry got his hometown history mixed up. New York holds a 2-1 series in the Eastern Conference final. The two teams meet again on Sunday night. 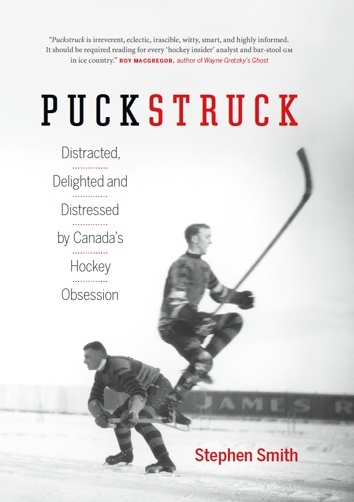 The history lesson came in the intermission between the third period and overtime when Hockey Night in Canada’s Ron MacLean cornered Cherry with a quick tribute to the earliest 1920s-era Rangers, including Frank Boucher and brothers Bill and Bun Cook, who (cue the Coach) lived for long years in Cherry’s beloved Kingston, Ontario. MacLean didn’t want Cherry to tell us all how the elder Cook, Bill, died — that’s what he said. 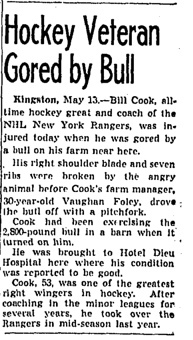 So Cherry did tell: Cook was a farmer and one of his big bulls crushed him against a gate. Q. Whom do you consider is the best player from Kingston, Ont.? A. We’ve had a lot of great players come from there, including myself, Wayne Cashman, Kenny Linseman, Jim Dorey, Rick Smith, Doug Gilmour, Kirk Muller. But the best, from what I’m told, was Bill Cook, a player for the New York Rangers back in the 1930s. He was a Hall of Famer, a big tough player who could skate like the wind and score. He was an all- star and a Stanley Cup winner. Unfortunately, a sad thing happened to Bill. He lived to be about 85, and still worked his farm there. He had a monster Holstein bull. People kept telling him, “That bull is too mean.” The bull killed him, caught him between a gate and a fencepost. It was a sad way for Bill to go out, but I would have to say he’s the best one ever from Kingston. In fact, Cook died in Kingston at the age of 89, in 1986, of cancer.